Headquartered in South Lyon, MI, Operation Injured Soldiers organizes camps and activities for veterans and their families. From hunting and fishing trips, to weekend getaway’s, Operation Injured Soldier provides both transportation and lodging for those traveling long distances. About two years ago, one of POAM’s Trac Fab chairs was loaned to one of Operation Injured Soldiers “hunts”. Afterward, Ed Spence, a disabled veteran (6/12/2007) and the founder of Operation Injured Soldiers, immediately began looking for a Trac Fab chair of his own to use on his New York hunting grounds. It was through this initial interaction that history began to write itself. Stepping back to 2014, POAM President Jim Tignanelli had become acquainted with an anonymous group of people in the New York and New Jersey area following the delivery of a Trac Fab chair to Aaron Alonso in New Jersey. This initial contact led to the group offering to help with a Trac Fab chair delivery anytime in the future. When Jim received word that a chair was needed in upstate NY, he reached out to the group. 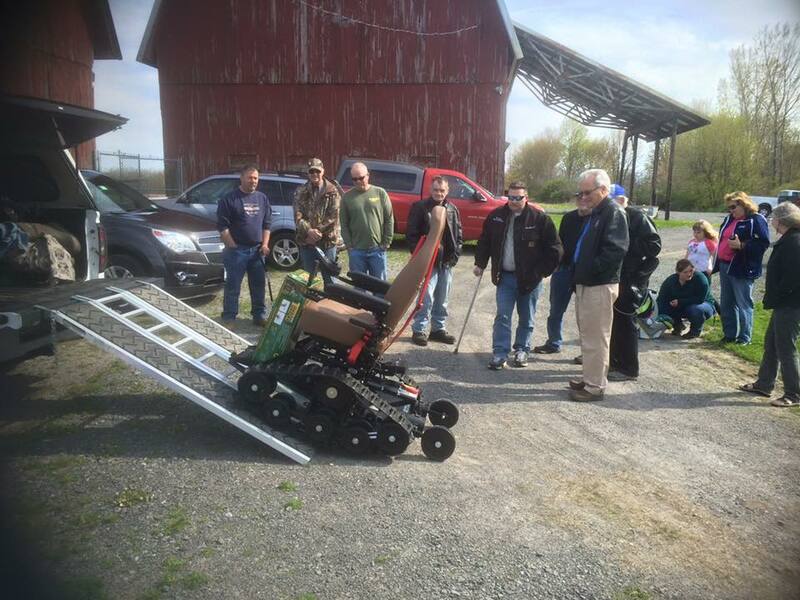 They generously paid the full cost of the Trac Fab chair and delivered it, along with POAM and Defender Mobility, on May 10, 2016 in Middleport, NY. Dave LaMontaine from the POAM Executive Board accompanied Jim Tignanelli through Canada to Middleport, New York. The chair was given to Ed Spence, who was more than ecstatic to receive such an honor. There, POAM and Defender Mobility were met by a very eager group of veterans! The chair, which provides a level of freedom these injured soldiers haven’t experienced in many years, was used the very next day and will remain at the site for future veteran visits.